LOS ANGELES, Nov. 4 (Xinhua) -- Twentieth Century Fox's biographical film "Bohemian Rhapsody" topped North American box office with an estimated 50 million U.S. dollars in its opening weekend, far exceeding expectations. "Bohemian Rhapsody" ranks as the second biggest opening in North America for a music biopic ever, only behind "Straight Outta Compton," which earned 60.2 million dollars in its opening weekend in August, 2015. 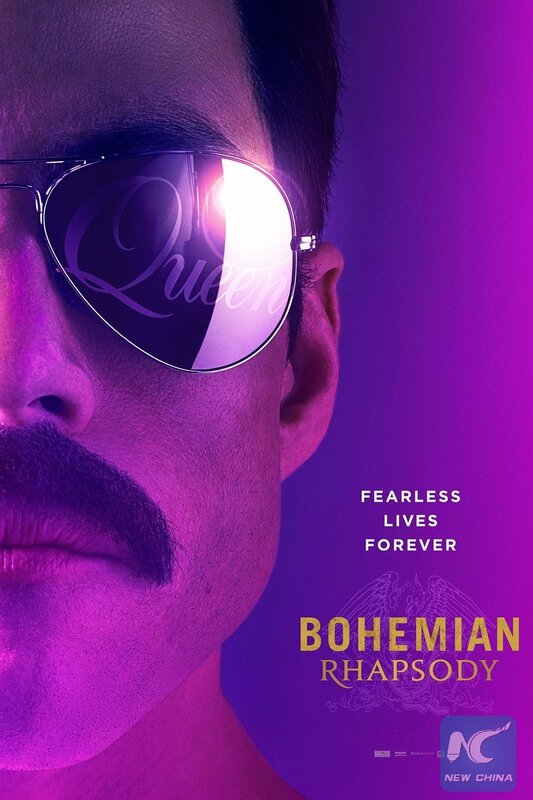 "Bohemian Rhapsody" received a positive "A" rating from moviegoers on CinemaScore and a 60 percent certified fresh rating on Rotten Tomatoes. The film brought in a massive 72.5 million dollars from the international marketplace for a global debut of 122.5million dollars to date, according to studio figures collected by comScore. Another newcomer, Disney's fantasy adventure film "The Nutcracker and the Four Realms" opened in second place with an estimated 20 million dollars in its debut. Directed by Lasse Hallstrom and Joe Johnston, the family-friendly film stars Keira Knightley, Mackenzie Foy, Eugenio Derbez, Matthew Macfadyen, Richard E. Grant, Misty Copeland, Helen Mirren, and Morgan Freeman. It's a retelling of the classic tale about a young girl who is gifted a locked egg from her deceased mother and sets out in a magical land to find the key. Paramount's romantic comedy film "Nobody's Fool" opened in third place with an estimated 14 million dollars this weekend. The film is directed by Tyler Perry and stars Tiffany Haddish and Tika Sumpter among others. The R-rated comedy follows a recently-paroled woman who tries to help her sister get revenge on the man who catfished her. Warner Bros.' romantic drama "A Star Is Born" landed in fourth with an estimated 11.1 million dollars in its fifth weekend, pushing its North American total to 165.6 million dollars to date. The remake of the 1937's film of the same name is directed by Bradley Cooper, in his directorial debut, and stars Cooper and pop singer Lady Gaga. The plot follows a hard-drinking musician who discovers and falls in love with a young singer, Lady Gaga's first lead role on the big screen. Universal and Blumhouse's horror film "Halloween" finished fifth with an estimated 11.01 million dollars in its third weekend. The film has earned 150.4 million dollars in North American theaters to date. It's the eleventh installment in the Halloween film series, and a direct sequel to the 1978 film of the same name.